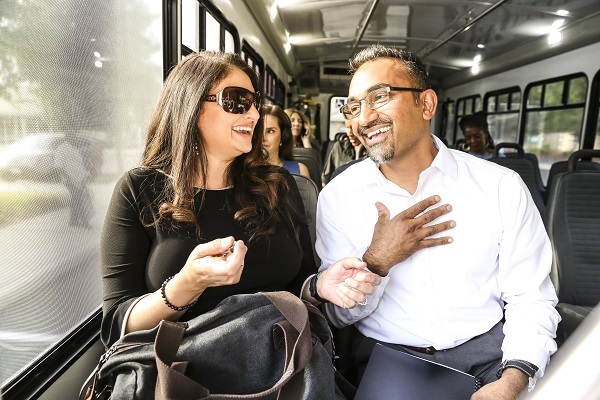 Are you curious about that sweet new fleet of Jibe Express buses that's making the rounds? Maybe you're wondering just how smooth that ride is. Maybe you heard about the free WiFi. Don't let a little thing like a fare come between you and a test ride. Try it out on us! New to Jibe Express? Sign up for a free round-trip ride. Tickets will be mailed to the address you provide. Already a rider? We'll give free round-trip tickets to both you and a new-rider friend when you refer them. Just a couple clicks to sign up. Need more winning? Take your referral to the next level by snapping a picture of you and your first-time-rider-friend on Jibe Express and post it (or two, if you're riding separately) to the Jibe With Us page to be entered into a drawing to win a pair of $25 gift cards to Raley's. Don't wait for the perfect planetary alignment, promotion ends October 31. If you've been waiting for an excuse to get out on a trail, then go find Sunday, October 14 on your calendar and write in tiny letters "Jackrabbit Trail Celebration." Abbreviate it if you like. 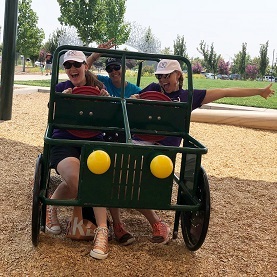 From 1:00 to 4:00 p.m. that day, there will be a slew of music, prizes, and activities along the four-mile Jackrabbit Trail that runs north/south between Elkhorn Boulevard and Airport Road. It's an open trail event. You don't have to start at 1 p.m. and you don't have to start at any particular point on the trail. Just lace up your shoes, bring the kids (or dog) and walk, bike or scoot whenever and wherever you'd like. Actually, we can believe it, and we're excited for it. It's a popular event that makes a lot of people happy. 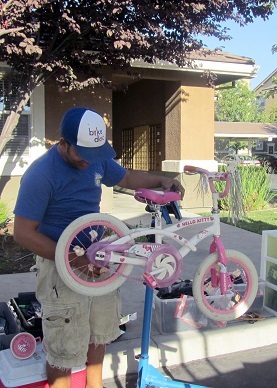 Join a whole bunch of community volunteers in North Natomas to help 50 kids transform bike parts into 50 ready-to-ride bicycles. The event is held on Martin Luther King, Jr. Day, which is designated as a National Day of Service. Next year, this special occasion falls on Monday, January 21, 2019. Kids in grades 5 - 12 who live, attend school, or work in North Natomas are nominated by local organizations for demonstrating traits such as respect, responsibility and citizenship. 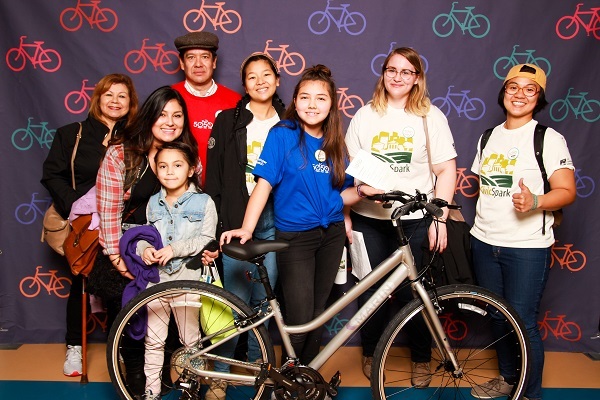 After nominations are reviewed, 50 kids are selected to build and receive a new bike during a highly energized event. The kids and volunteers experience the rewards of teamwork and community. We're always looking for additional sponsors and volunteers to help make the event a great success. And we're also eager to find inspiring kids who would benefit from building and receiving a new bicycle. Sign up to sponsor or volunteer. You can also nominate; nominations must be received by November 15, 2018. Knock Knock. Who's there? Bike Doc. Does a squeaky wheel need some grease? Is it feeling a little flat? Have no fear, Bike Doc is here! It's the unique mobile repair shop that visits schools, businesses and community events with a team of bike mechanics to diagnose, tune up and repair your bicycle -- for free! Please, only one bike per person per event and remember that bikes are accepted on a first come, first served basis. Every year, this month-long campaign celebrates and rewards children for ditching the car and walking to school. This year students from eight North Natomas schools will track the number of trips they walk, with a collective goal to "walk" the length of the United States. Last year, five schools pulled it off and each won a check for the amount of gas money saved for that distance! This year's Walktober will be kicked off with Walk to School Day celebrations, where families that walk (or bike/scooter/skateboard) to school enjoy free breakfast and a dance party before school. Learn more about your school's event. Experiencing freedom, especially on two wheels, is a big part of growing up. And freedom is best enjoyed safely. There's a fun and easy way to make sure your kids pedal smart: the Project Ride Smart video series. 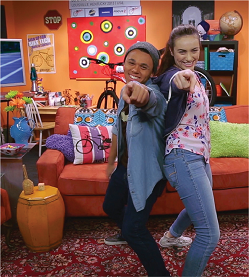 It's hosted by two savvy teens that show kids all they need to know to bike with confidence. After completing the series, kids will understand fundamentals like riding on the street versus the sidewalk; right-of-way rules and how to navigate intersections. Each of the episodes is entertaining, relatively short and something parents can easily watch and talk about with their kids. You can also get a DVD copy for $35. Stream or download the whole thing. 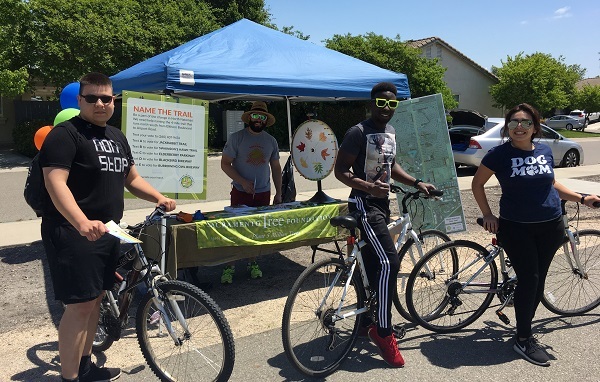 See who's who on the streets and trails of North Natomas and post a selfie of your own on our social photo board. So many smiling faces, so many people out and about. Upload your photo square today! And don't forget to share on social media with #JibeWithUs. There are so many benefits of walking to school. Kids arrive feeling more focused and better exercised. And it's nice for your neighborhood, since it means reducing the pollution and traffic around school. But many people just live too far away! There's a Walking School Bus for that. Walking School Buses are adult-supervised walking groups that meet near schools where families can walk together, or parents can drop off their students to walk with the group. Find out when and where the walk starts at your school today.